Notes: It was a very wet week at MBO, with net hours under half of what they typically have been this fall. However, during the sometimes brief dry spells, we managed to band a good number of birds as this year's October migration continued in full force. 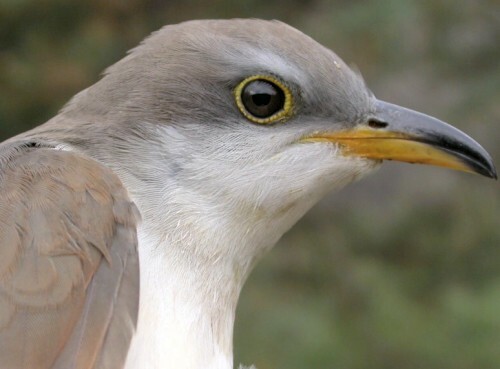 The highlight of the week was the Yellow-billed Cuckoo shown above, which we banded on Wednesday morning. In most years there are only a couple of fall records of this species in Quebec, but this year there have already been at least 15, indicating an unusually large northward post-dispersal movement beyond the cuckoo's normal breeding range. It became our 91st species banded at MBO, and one of the most surprising, especially this late in the year. 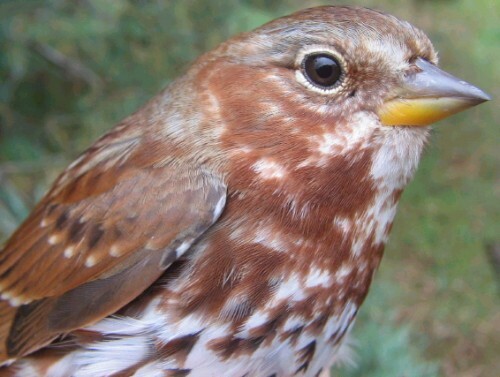 Other species banded this week for the first time this season were Fox Sparrow and American Tree Sparrow, both arriving 'on schedule' with respect to their occurrence here last fall. In terms of species observed, our fall list jumped by five species this week. In addition to the three new species for the banding list, we also had our first flock of Snow Geese on Monday, and a Green-winged Teal was on the pond near net G1 on Saturday. (Note: reviewing the season list this week, we realized that two earlier additions -- Greater Yellowlegs on Oct 5 and Savannah Sparrow on Sept 28 -- got missed as newcomers, and thus the total for fall has been increased to 140). Overall, species diversity is declining noticeably as we move toward the late part of the fall migration, with the number observed this week declining to 68. Nonetheless, we still had daily totals in the low 40s on four days, which is quite impressive for this time of year. New late season dates for species this week include Rose-breasted Grosbeak (Oct 11), Wood Thrush (Oct 13), and Gray Catbird (Oct 15). The top five species banded this week represent a dramatic shift from recent weeks. American Robins have suddenly arrived in tremendous numbers, with between 180 and 500 observed daily, and 34 banded despite our rain-limited net operations. On the other hand, the White-throated Sparrows which have been so dominant over the previous month largely departed, falling to sixth place among banded birds this week with 10. The remainder of the top five were Slate-coloured Junco (32), Ruby-crowned Kinglet (26), Black-capped Chickadee (16), and Yellow-rumped Warbler (12).